This is a most inexpensive luxury for your bath. It makes you smell good afterward, but it is also delightful while you soak. Place the herbs of your choice in a doubled square of cheesecloth. Gather up the corners of the cheesecloth and tie securely. Toss the herb bag into a hot bath to soften and scent the water. Once you're in the bath, rub it all over your skin. Buy four brightly colored washcloths. 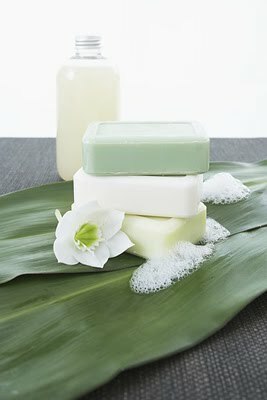 Use each to wrap a homemade bath products: Almond Rose Soap, Delicately Scented Bath Powder, Bath Cookies, and Eucalyptus Foot Lotion, for example. Be sure each is labeled with ingredients and storage instructions. Nestle the bath treats in a nice basket that could hold extraneous bath supplies and attach a card with a large bowl. If a recipe calls for 1 cup of buttermilk and you don't have any on hand, pour 1 T of white vinegar or lemon juice in a 1-cup measure and add enough regular milk to make 1 cup. Or simply substitute 1 cup plain yogurt.